(Galerie Beyeler, Basel, by March, 1980); (Annely Juda Fine Art, London, by July 1980); (Helen Serger/La Boetie, Inc., New York, by 1985); Ruth Kainen, Washington, D.C. (not in Lugt); Gift to NGA, 2012. 20 Werke von Kurt Schwitters. Galerie Vörnel, Düsseldorf, 1971, no. 17. Autres dimensions: collages, assemblages, reliefs. Galerie Beyeler, Basel, 1976, no. 80. Petits Formats. Galerie Beyeler, Basel, 1978, no. 142. Abstraction 1910-1940. Annely Juda Fine Art, London, 1980 (not in cat.). Lettres et chiffres. Galerie Beyeler, Basel, 1980, no. 79. Collages and Reliefs 1910-1945. Annely Juda Fine Art, London, 1982, no. 56 (repro. p. 58). 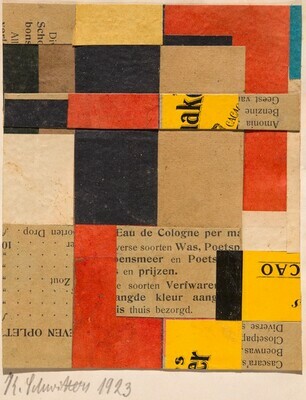 Kurt Schwitters: Dada, Collages, Drawings, Objects. Worthington Gallery, Inc. Chicago, 1982 (repro. p. 25). Kurt Schwitters: Words and Works. Helen Serger/La Boetie, Inc., New York, 1985, no. 16.